Well I have finally done it! 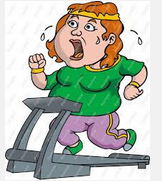 I overcame my terror and dread of running on a treadmill, I didn’t enjoy it at all, but I did it. My little mini interval thing was 1.5 minutes building from 3 mph to 5.5 mph then 1 minute jogging / running at 5.5 mph, then 1 minute walking at 5 mph, a second 1 minute run and a final short walk to finish. I got off the machine with shaky legs and feeling sick but I won the battle.